125 crore Indians are my Gods and I am serving them: PM Narendra Modi. "A youngster Shehzad has exposed the rigging that is taking place in the Congress president poll. Shehzad is a senior Congress leader in Maharashtra. Congress has tried to muzzle his voice and wants to even remove him from their social media groups. What tolerance is this?" "A few days ago I said there are 3 polls whose results are certain- UP local polls, Gujarat polls where I said BJP will win and the INC President election where 1 family will win. We saw what happened in UP," said PM Modi in Surendranagar. 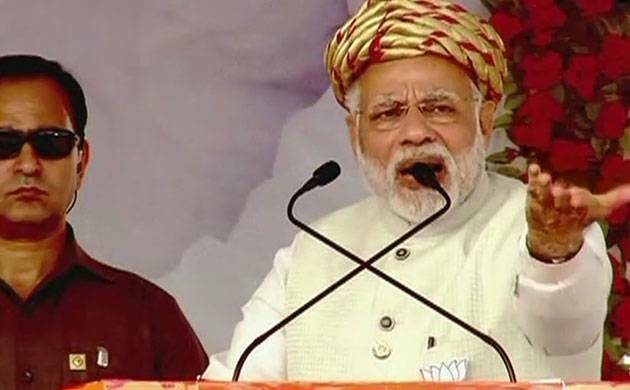 Sharpening his attack on the Congress in poll-bound Gujarat, Prime Minister Narendra Modi on Sunday accused the opposition party of seeking to divide society on the basis of caste and religion. Resuming his campaign in his home state, where the first phase of Assembly elections is to be held on December 9, Modi lashed out at the Congress, saying that it wanted to create “walls between brothers”. “The people of Gujarat know what the Congress is up to. It changes colour time and again, creates a wall between brothers,” he said. Addressing a rally in Bharuch district, Modi said the party made “one caste fight with the other, one religion fight with another”. “They keep you busy in fighting with each other. You may die but the Congress will eat ‘malai’ (cream),” he said. The prime minister is slated to address two more rallies in Surendranagar and Rajkot later in the day. Bharuch goes to polls on Saturday. Gujarat will vote in two phases - on December 9 and 14 to elect a 182-member Assembly. The counting of votes will take place on December 18. For all the latest Assembly Elections News Download the News Nation App available on Android and iOS.